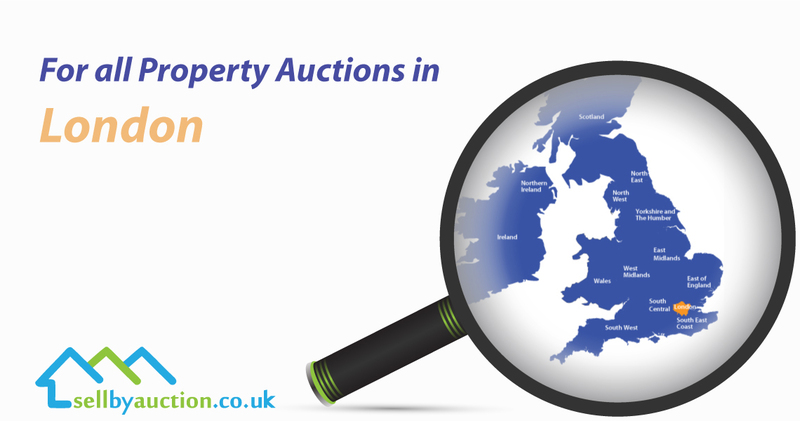 London Property Auctions with national property auctioneers Sell By Auction. Essential to our regional success we also have a central London auction room. We take instructions from clients selling every type of property under every possible circumstance across the whole of the UK. We cover all London boroughs, including Croydon, Westminster, Bexley and Hackney. The majority of our auction Lots run through our local auction rooms. However, our London auctions regularly feature Lots from all parts of the United Kingdom. Property market and selling through auctions throughout UK requires decades of experience when you want real results. Our clients have the option of offering a property through our local and regional auction. However, in some cases on the auction appraisal, we may advise selling through our London Property Auctions. It may be that the next London property auction is earlier than the regional property auction, which will be more convenient for our valued client. Or the asset to be auctioned is better suited for the London property auction. Typically, higher value Lots and commercial property with multiple tenants and a high rental income will sell better through our London property auction sale. There aren’t many local buyers for high value; multi-let commercial properties, most buyers for this type of asset are based in London UK. Overseas buyers, London-based investors, commercial property funds, pension funds and investment companies usually only attend the big London auctions. Professional property auctioneers such as Sell-by-Auction will offer the best possible advice and the option of where to place your Lots to maximise sale value. Read our blog about a hotel in Blackpool that sold through our London property auction for more than 200% of the Guide Price. Can I sell multiple lots or a portfolio through the London property auction, even though they are spread all over the UK? Yes. In fact, selling a multi-lot portfolio of mixed residential, commercial or mixed-use properties, vacant, or let, in one auction is substantially more convenient for the selling client. They get to sell all their assets on the same day at the same location. Buyers benefit from being able to bid on multiple lots at the same time; they may even want to bid on the whole portfolio. The seller will benefit from reduced selling fees – we will negotiate a bespoke rate for selling multiple lots. The seller also benefits from a more efficient and simpler to administer selling process. Get a selling quote and free valuation here. Sell by Auction have an unique selling point (USP). We can instruct our local and regional auction rooms to market the properties and hold viewings locally. Combined with a central London location and national marketing campaign, we ensure that all buyers are made aware of out of area Lots. Sellers enjoy the benefit of bids from local, regional and London buyers; they get the best of both worlds. A Prestigious Central London auction combined with our local auctioneer’s expert marketing.